Congratulations, you have finally decided to get married! 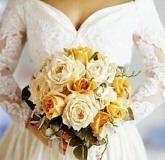 Have you decided to hire a wedding planner? If no, not a problem! Is it really tough to shop for the wedding dress of your dreams? Want to look perfect on your wedding day? Here are five easy tips for wedding day beauty. Is A Mermaid Style Dress Right For You?